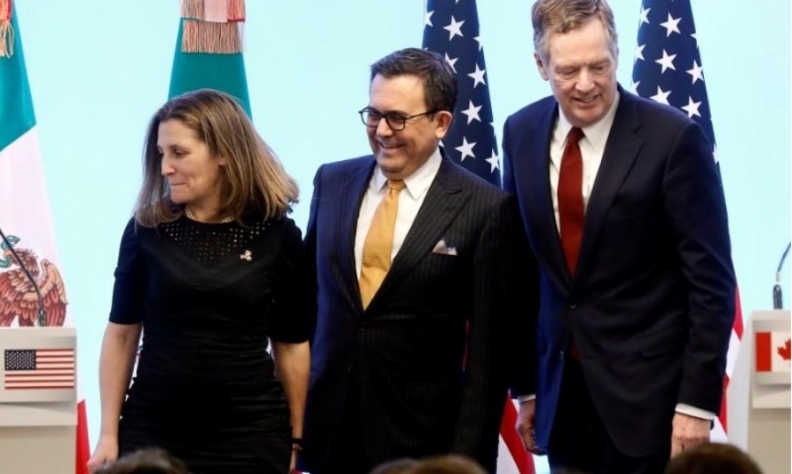 Canadian Affairs Foreign Minister Chrystia Freeland, Mexican Economy Minister Ildefonso Guajardo and U.S. Trade Representative Robert Lighthizer take part in a joint news conference on the closing of the seventh round of NAFTA talks in Mexico City back in March. “We’ve had all our [negotiating] teams in Washington for two weeks and we will continue working all this week, the weekend and into next week,” said Kalach. Mexican Economy Minister Ildefonso Guajardo said also on Tuesday that agreeing to a new NAFTA deal will depend on the flexibility of negotiations as he prepared to meet his U.S. and Canadian counterparts in Washington. “Any day that you start [to] walk towards a goal nobody can guarantee that you will achieve it, [it] depends on the commitment and flexibilities around the table,” he told reporters when asked if a deal was imminent. Guajardo also said there was no need for a separate deal with the United States on steel and aluminum by May 1 when the current exemption on U.S. tariffs expires. “I think whatever we do has to take into account the kind of commitment that we’re going to do in NAFTA, and definitely, Mexico has been very clear: we will not accept any type of restrictions in aluminum or steel,” he said.